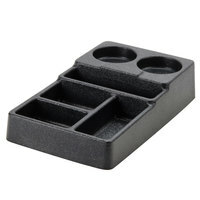 Organize your coffee station with this Carlisle 1082803 8 1/4" x 14 1/2" 6 compartment coffee condiment caddy organizer. When you're offering your customers or employees a variety of sugar packets, creamers, and other coffee condiments, the stock can become unwieldy. With this 6 compartment organizer, you can easily contain and display all of the available creamers, sweeteners, stirrers, and even tea bags so that they're visible and readily accessible for all of your coffee drinkers to enjoy. This is a well constructed, easy to clean and use condiment caddy. I paired it up with an espresso cart for one of my clients, a local school district. I still have this product in my kitchen. This is a very durable ABS plastic that will no disappoint you. The price is another advantage if you are looking for an small coffer organizer that will last longer than regular ones. Recommended. The Carlisle Six Compartment Coffee Condiment Caddy Organizer is great for storing cups and condiments in one place. The various slots are good for having tea, coffee pods, and condiments in their respective slots. When we remodeled our new office area we wanted to have something nice and neat to hold our coffee supplies. This worked great. It does not take up a lot of room and is very cost effective. This is a great item to have to help organize your coffee area. The price is amazing for the quality of product you receive. I would highly recommend it. When you only have a small space to put out three urns (coffee, decaf, hot water) this organizer fits in between wonderfully! Held the large creamer and sugar canisters, stirring sticks, sugar substitute and even 2 types of teabags. Every thing we needed to make over 50 folks happy. Very sturdy too. Was able to move it around without having to remove everything first. Awesome product, thank you!! I had never seen a product like this before I ordered it but I must say I am totally hooked. You get everything for your morning coffee right at your fingertips on the way out the door. I am happy with this product to display my creamer, sugar, sugar packet and drink stirrers. The sizes of the compartments are perfect, I would have liked it to be just a little more sturdy, but it is a great product. I actually put this unit next to the coffee maker in our break room. The round spaces are for cups and lids i presume but a glass sugar pourer and creamer canister fit in them perfectly. One of the slots holds the bamboo stirrers i purchased here. Great little unit. Very happy with this caddy. It is heavier than I thought, given how inexpensive it is. It held the bamboo stirrers I bought here at Webstaurant.com as well as the sugar pourer, assorted brands of artificial sweeteners and tea bags in foil packs. Holds sugar packets.. Check! Holds creamer.... Check! Holds the cinnamon bottle.., Check! Holds the Stevia packets... Check! Holds the Stirrers (Wood ones... Plastic is just no Bueno) Check!! Yup!! Another good buy at Webstrauntstore.com!!! Great deal for the price. This is not a heavy-duty plastic. Would prefer 2 additional round sections for sugar canisters. Super speedy shipping! Thank you! This caddy is very handy for small gatherings. I keep it stocked for easier serving. I wish it had one or two more round compartments. I need to use cups/lids and sugar canister too. This coffee caddy holder is very functional. It has worked out well for us at our small coffee table. I thought it was larger than it is but for our purposes it worked out fine. It's a no frills condiment caddy, but it does the job for what we need. It holds our sugar packets, stirrers, sugar jars, and coffee sleeves. With limited space, it was a good size option for our countertop. This caddy is an inexpensive way to keep organized. Used this to keep the coffee station organized for my wedding reception. Did the trick and looked really nice! Might use this at home too, but if not, it will be good out break out for parties! I was looking for a nice and neat way to store the coffee products in my store. This worked like a dream. I don't offer much, so I didn't want anything extravagant. This served its purpose and is easy to clean as well. Thank you for your feedback! We're sorry you did not prefer this organizer. For recommendations, please contact our Customer Solutions team. We purchased one of these for each of our office kitchenettes to replace the "baskets" we used to have and this is such a nice improvement! Keeps everything nicely organized and easily accessible for staff. Sturdy enough for the purpose they serve and an attractive space saving kitchen accessorty. This piece has it's pros and cons. It is thinner plastic than I thought it would be, but it is quite durable. It is very light though, it can get bumped around. The compartments are great though. Perfect size. I would say buy it, but just remember it is an inexpensive caddy. This is a perfect caddy for our coffee and hot chocolate station. Also allows us to display teas for our customers. It's nice and compact and stores away easily when not in use. I have mixed emotions about this 6 Compartment Coffee Condiment Caddy. On one hand, I expected the plastic to be thicker/heavy but on the other hand the compartments are just right. Customers won't have to go liookng for differnt condiments in different places, they're all condensed in this caddy. These are great! Keeps our coffee station very neat, clean, and organized. They are very sturdy, even though they don't look like it. They also clean very easily. Love this item and for the right price. It keeps every thing organized and its easy to clean too. I love the space for the sugar shakers. Worked great for the price. Can create a nice looking coffee bar without spending a lot of money. It isn't as sturdy as I thought looking at the picture but it had held up just fine with two creamer canisters, stirs and sugar packs. I plan to order another one for the bigger coffee bars I have coming up. This Carlisle Caddy is great for a small coffee or tea self service station!! It has space for all the additional condiments and you can even put milk and cream out in convenient pourers that fit in the back compartments!!! I am a freak for being organized and this is perfect. It has a spot for everything. Sugars, stirrers, tea packets, splenda, etc. It's great for coffee hour! Love this. I took it to church to use for an event and never got it bsck. My pastor loved it. Now I need to order me another one. Very sturdy and looks great. Its light weight. This organizer is great for sending out with catering orders as it can hold all the necessities and it comes at a great price. We love our organizers we ordered! This compartment coffee condiment caddy oranizer just made my coffee condiments look so much more organize. It keeps the condiment in one place and does not require much cleaning. I agree with all the other reviews - this is a great item for the price! We use the top for a sugar pourer and drink cups, only wish our creamer would fit. Keeps the coffee bar at our church organized. The plastic is lightweight and won't take much abuse, but it is good value for the price. Great little organizer. Is a little flimsy. You have to put it on a tray if you are going to carry it. Great idea!! Lots of compartments!! The low price was what attracted me to this item first, but it was a pleasant surprise to see how well it organized our counter top.